If you’ve hesitated to update your bathroom because you were worried about embarking on a costly and disruptive home renovation, The Super Plumber has the answer! 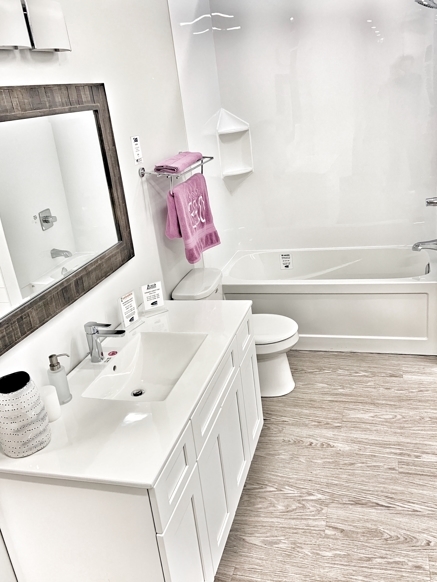 Our expert bathroom remodeling, design and renovation team can totally transform a standard bathroom in just five days—from start to finish—including demolition, installation of new fixtures, faucets, lighting and flooring, even a fresh new coat of paint. The Essential Bath is even more amazing because of its price tag. For just $11,995 + tax, you get a complete bathroom renovation including all materials and labor for a standard 5' x 8' bathroom. As with all renovations completed by The Super Plumber, homeowners can always count on an amazing experience! Our team looks after every detail of your renovation, from the initial consultation to the construction phase. We also have our own team of journeyperson electricians, plumbers, and carpenters who ensure the work will be done on time, on budget, and to your satisfaction. One of the biggest factors in the value of your home is the state of its bathrooms. According to the Appraisal Institute of Canada, bathroom and kitchen renovations are the most popular home improvement projects, as they have a 75 percent recovery rate. That means a $10,000 renovation to a bathroom can increase a home’s value by $7,500. The average person spends 3,000 minutes in the shower every year. According to Google, 39% of people take their smartphones into the bathroom. One in five has dropped a smartphone in the toilet. Researchers have discovered that singing in the shower not only boosts your immune system, it lowers stress related cortisol levels linked to heart health.